Facebook and Snapchat are two popular social media apps. They help us to be in touch with our friends, family members and other unknown people. For personal and business life, it's very important to be active on all your social accounts nowadays and these apps makes it easy to manage everything on your fingertips. If you have a smartphone, you have probably installed both these apps in your phone. Although they have good user interface but after doing some research, I have concluded that these apps are simply useless and everyone should uninstall them. Sounds weird? But that's true. Here's a complete report on this topic. Why Facebook & Snapchat apps are culprit? The battery usage of these apps is very high. In fact, they are the main culprit to drain battery life. One of the reason is, they are always running in the background even when you are not using them. When I checked my phone's battery usage report, both Facebook and Snapchat are in the top 5 list after Screen and Android System. To check your phone battery usage, first go to Settings > Battery. There you will see all apps arranged in the decreasing order of their battery usage. Next to each application, you'll find the percentage of battery used by it. This report depends on your usage since last full charge. As like other apps, Facebook and Snapchat are always running in the background. They do so for some good reasons such as for push notifications, syncing purpose, providing location data and doing other things what they were made to do. Even this is the main behind why Facebook and Snapchat eat unnecessary battery life and storage. To know which apps are running in background, again there is in-built feature in Android. Simply go to Settings > Apps. Now scroll left to the running tab and there you will find all apps and their services running in the background currently. Although you can force stop them any time but they may start working again. There is no doubt in fact that Snapchat and Facebook uses unnecessary mobile data. 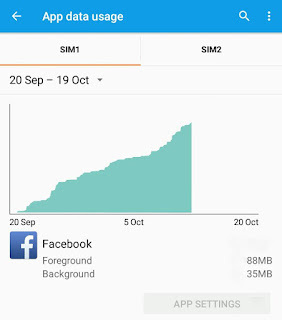 I have analyzed their data usage and it comes as a surprise to me that their background data usage is very high, especially in case of Facebook app. Again they are the in top 5 list after Google Chrome and UC Browser. To check your own phone data usage report, go to Settings > Data Usage. Next to each application, you'll find the data used by it in MBs. Now click Facebook and check its foreground and background data. You can also analyze it quickly with the help of graph. Luckily, there is an option in Android settings which lets you restrict background data so as to reduce your mobile data usage. To turn on this option, again go to Settings > Data Usage. Here click the menu button (three dots). Next, tap the "Restrict background data" option and then click OK to continue. 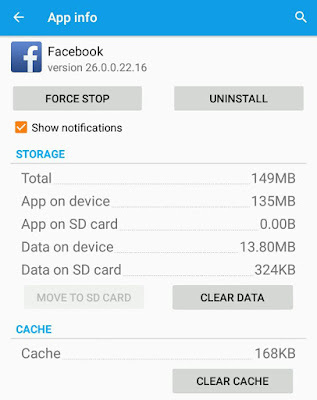 Once after installing, both Snapchat and Facebook are more than 200 MB in size. They eat unnecessary storage by saving lots of cached data in internal memory. To monitor their storage usage, first go to application settings and then click the app name. Here you can clear app cache and data manually. If your phone is running out of low space, it can slow down the performance and speed due to which some functions may stop working. To solve this issue, you should delete cached data regularly. You can also move some apps to the SD card which will free up little space in your phone's internal memory. 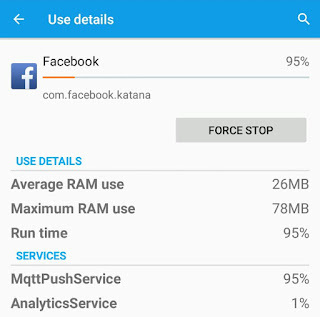 The RAM usage of Facebook and Snapchat apps is very high. I am not saying this, again reports says. You can see the geeky stats about running processes in developer options. 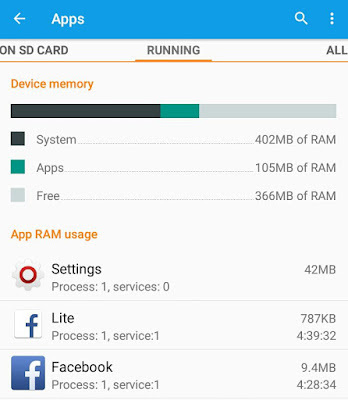 There you can also monitor RAM memory usage of your phone but that's beyond the scope of this tutorial so I am just showing you the screenshot. Due to low RAM memory, your phone may start hanging (what most of the Samsung users face) or apps will crash automatically after a long use. The only thing you can do to free up RAM space is, clear cached data and uninstall all useless applications. From above study, we can conclude that these apps are developed by keeping user interface (UI) in mind, not user experience and that's why I recommend you to uninstall them. 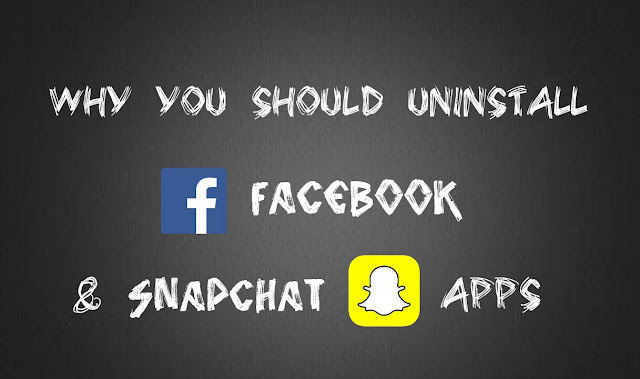 Now the question arises, if you will uninstall the apps, then how to use Facebook and Snapchat? Luckily, you can access Facebook from a web browser directly. I recommend you to go with UC Browser because it uses basic site version of Facebook. Facebook has also launched another light-weight application named "Facebook Lite", which is very small in size and it has comparatively low data usage. Unfortunately, we don't have any alternative solutions for Snapchat. There is no light-weight application available and neither you can use Snapchat from a web browser directly. It would be a more wise decision to uninstall both these apps but if you have enough space in your phone, you can keep them. Please drop your views in the comment section.